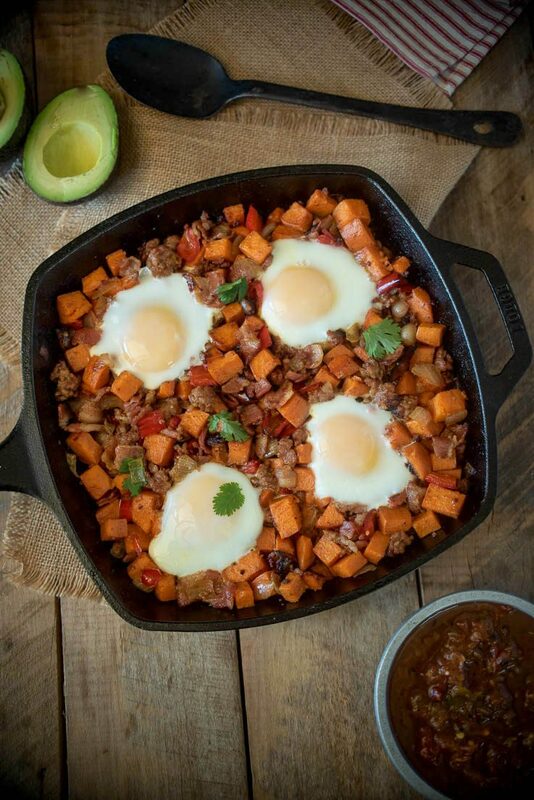 Sonoran Sausage and Bacon Breakfast Skillet is the perfect one-pan dish for holiday breakfast or brunch. 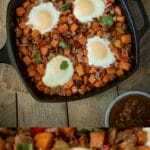 Juicy pork sausage and smoked bacon are sautéed with bell pepper, onion and spices and topped with 4 sunny-side up eggs. The holidays are a time for big dinners with family and friends. That doesn’t mean we should skimp on breakfast! You need to start the day right and keep everyone well fed so they don’t keep asking how long until dinner time. I think you can all relate. If you’re on the West Coast, you can find these products at Food 4 Less, Foods Co, Ralphs, Ralphs Fresh Fare, Ralphs Marketplace, & Fry’s, located in the fresh meat department. I found them both at my favorite Kroger banner store Fry’s. The Farmer John’s Classic Pork sausage links are both tender and juicy. They are rich in flavor and perfect for this dish because there are no casings to remove. The sausage cooks up like ground meat and mixes in well with bacon and vegetables. It pairs perfectly with Farmer John Classic Bacon that is naturally smoked and of the highest quality. It is a breakfast that is a match made in heaven. Farmer John has other sausage and bacon products to try that are all just as good. Be sure to check out their Maple Pork Sausage (made with real maple syrup), Thick Cut Bacon, Old-Fashioned Maple Bacon and Lower Sodium Bacon. 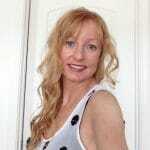 They also have a great page of recipes, you can find them here > Farmer John recipes. 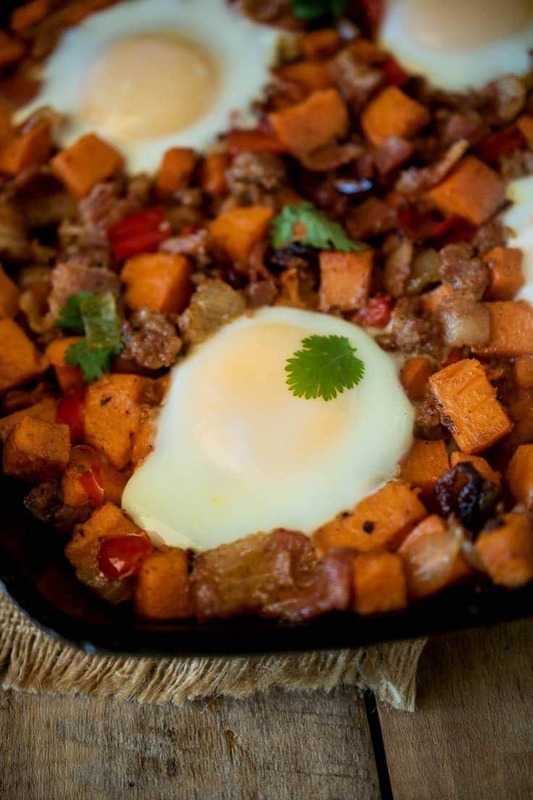 This is the ultimate one-pan breakfast/brunch that hosts everyone’s favorite breakfast items, sausage, bacon, potatoes and eggs. You can use any of your favorite potatoes, but since it’s the holidays, I used sweet potatoes which also gives a lovely pop of color to the dish. For that Sonoran flavor kick, I used a combination of mild chili powder, cumin and chipotle powder. They do not make the dish spicy, but add a little something extra in the flavor department to bring the Southwest flavor home. 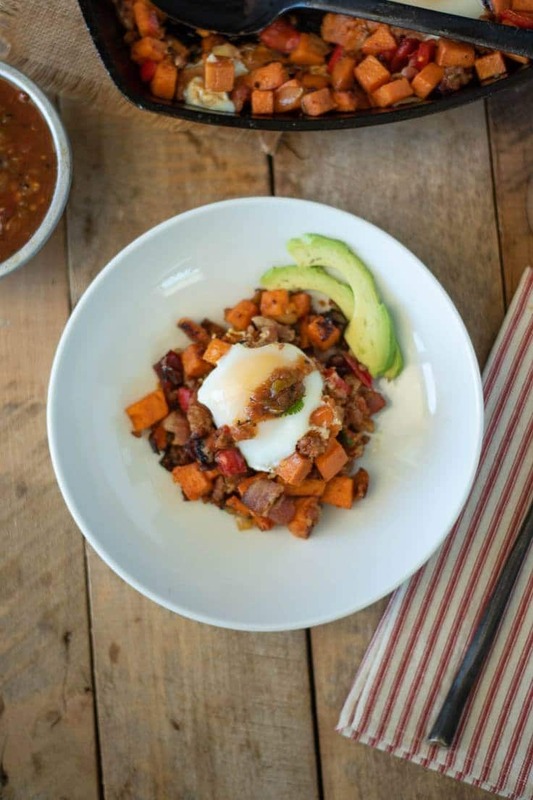 Serve this dish alongside your favorite salsa and freshly sliced avocado and you will create holiday breakfast memories that will make everyone request this dish over and over again. If you’re like me and are busy in the kitchen around the holidays, you can make the Farmer John sausage links, bacon and potatoes the day before. Refrigerate, then re-heat in a cast iron skillet and add the eggs. I’m all about time-saving when it comes to holiday meal prep and this is a fast way to feed your family first thing in the morning. I have to say that a cast iron skillet truly makes this dish what it is. Because it stays so hot during cooking, the sausage, bacon and potatoes get crispy and develop a nice crust on the bottom. You can’t get this with any other pan. Make sure you save the crispy parts for the cook, you earned it. 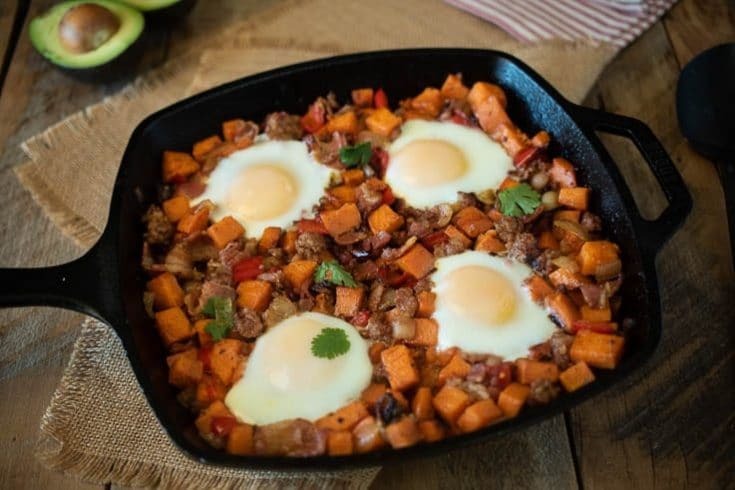 If you’ve tried this Sonoran Sausage and Bacon Breakfast Skillet or any other recipe on the blog then don’t forget to rate the recipe and let me know what you think in the comments below. I love to hear from my readers! Juicy pork sausage and smoked bacon are sautéed with bell pepper, onion and spices and topped with 4 sunny-side up eggs. Add oil to a cast iron skillet or oven-proof skillet, over medium heat. Add the Farmer John sausage links and Farmer John bacon and cook according to package directions breaking up the sausage. Cook until the sausage and bacon just start to brown. Add the onions and bell pepper and sauté until the onions are softened, stirring often. Mix in the chili powder, chipotle powder and cumin and salt. Add the potatoes and mix well, spreading into an even layer. Cover with a lid or foil and allow the potatoes to cook for 5 minutes. Stir, make an even layer. Cover and cook for 5 more minutes. Repeat this step until the potatoes are tender and cooked. Remove the lid and turn the heat down to low. Make 4 wells in the potatoes using a small, 3-inch glass or cup. Crack an egg into each well. Cover and cook for 5-8 minutes or until the eggs are set. Serve with sliced avocado, salsa and chopped cilantro.